I heard a gentle knocking at the door and realized two things: I had needlessly locked it out of habit, and Caleb was at the door first (his sister would have been pounding it). I turned the bolt, opened the door, and in bounced Caleb proudly and protectively holding a small tree wrapped in a paper-towel and a bit of plastic wrap. In an instant my mind swept back nearly 24 years. Arbor day, 1987 I was a buck-toothed, four-eyed fifth grader that made friends making fart sounds and folding paper frogs. The Arbor-day folks passed out Elm trees and I remember what a great day it was when I took it home and my dad helped me plant it in the backyard. We mowed around that tree for 7 years, and then I went to college. Each summer when I came home I would walk back and measure its growth. That tree kept growing and getting taller each year, and it always brought back the memory of that day me and my father placed it in the ground. It was a bit of a monument for me, and it still is. A good day for a father and son to learn about life, hard work, long-term reward, and working together on something meaningful. I asked Caleb if I could help him plant it, and he quickly smiled and said, "yeah, sure." I asked him where he wanted to plant it, silently hoping he would select the back yard. Of course that was not the case, he wanted it directly in the middle of the front lawn. I measured in my mind the strange looking twig sticking out of the front yard against his excitement and the importance of this memory. We geared up in our work clothes, me with my large leather gloves and spade, and Caleb with his boy-sized gloves and shovel. We stepped off the yard, selected our spot, and began tearing up the sod in the middle of my front lawn with two of my neighbors observing. "What are you doing there?" I replied, "Planting a tree." He said, "And you're digging up all that good dirt?" "Yep." Caleb cut out the first piece of earth and then I helped him form the bed that would surround the tree. The neighborhood observers now grew to three retirees. I could hear them muttering to themselves as we continued to remove the earth and form our new home for the Dogwood. The time came for us to put the tree into the earth. 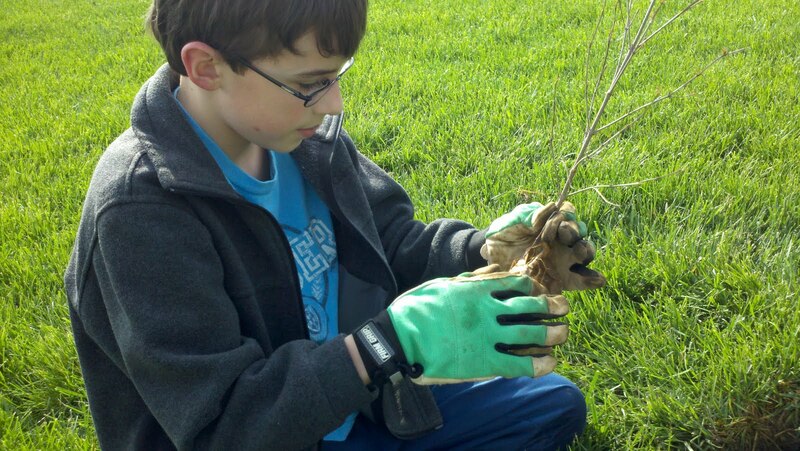 We took off our gloves so we could feel the richness of the cool soil on our hands. 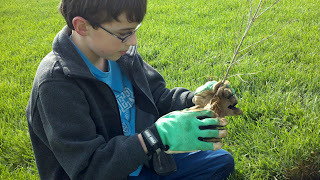 Caleb carefully unwrapped the roots and I saw him looking closely at their substance. After a moment, he held it over the ground and looked up with a smile as I took a picture. The neighbors suddenly stopped their conversation and caught the moment with heartfelt clarity spreading across each face. I received a silent nod from as I realized this man, my friend now thought of his own father and son. 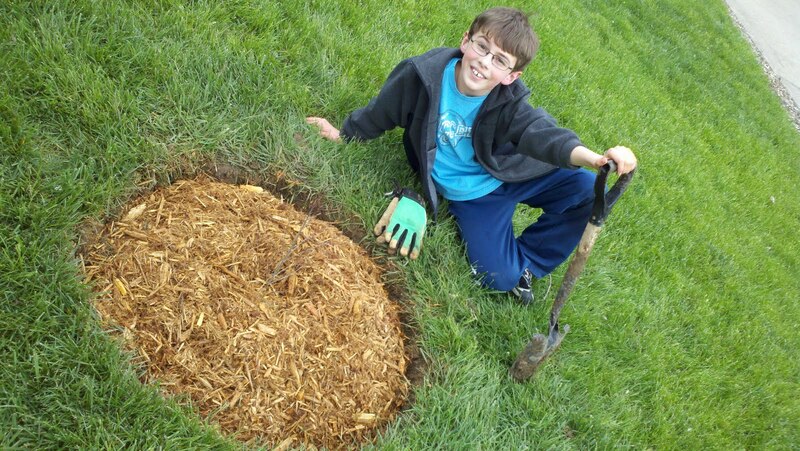 The tree now is plainly visible as an 18" stick surrounded by a cubic yard of mulch. But when I see it, I see a beautiful 30' tree that shades the front of our home and that also represents two very significant days in my life. I hope that this tree and this day can someday be a good memory for my son. It surely always will be for me. I get one shot at this, and I am so thankful I did not miss this moment. The subtle wisdom of trees. Excellent post! Your son is blessed to have a daddy who "gets it". Aleksandra Elise: (2) What is Love, Without Risk? Aleksandra Elise: (11) Are We There Yet? Aleksandra Elise: (13) American Tourists!